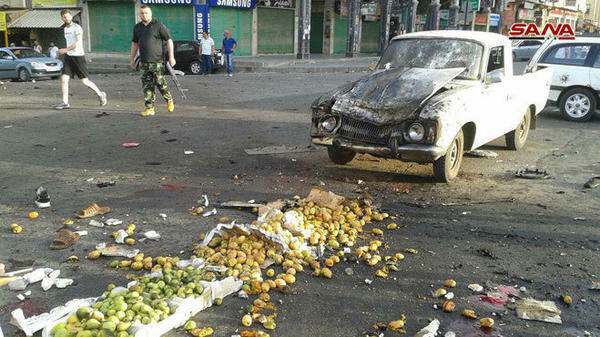 The aftermath of a suicide bombing attack in Sweida, a city in southern Syria, is seen here in a photo released by the state-run Syrian Arab News Agency. Other attacks followed. Images from the scene show a truck with a burned and dented hood, sitting in a wide street next to fruit and vegetables from a stall. The ground nearby was littered with charred debris and a pair of sandals, along with a pool of blood. Elsewhere, bodies lay amid the wreckage of part of a building's exterior that was destroyed. The attacks were just one element of the violence to hit the area on Wednesday. Describing a chaotic scene, the Syrian Observatory for Human Rights says pro-regime militants and armed villagers also clashed with ISIS fighters in and around Sweida whose attacks were apparently timed to coincide with the bombings Wednesday morning. ISIS has claimed responsibility for the bombings, in a statement released through its social media channels, the SITE Intelligence Group reports. Overall, the Syrian Observatory said, more than 150 people were killed during the day, including at least 62 civilians and more than 90 locals who joined in the fight against ISIS. State media report that in addition to the bombers who carried out their attacks, authorities "hunted down two terrorist suicide bombers who had been wearing explosive belts and killed them before they were able to blow themselves up in the residential areas in the city." The wreckage and severe injuries made the full extent of the damage in Sweida hard to assess, hours after the attacks. The intense violence is unusual for Sweida, a southwestern city in a province of the same name that has been spared some of the harshest ravages of Syria's long-running civil war. The Syrian government has been fighting to rid the last vestiges of ISIS from surrounding provinces, Ruth Sherlock reports.